We want to create a workspace adapted to millenials. A second home, with friends rather than colleagues, a place where sports and mental exercise are rooted into the corporate culture, increasing overall productivity. Bring together all your coworkers in a healthy digital community, where they can share healthy stories and participate in healthy activities. Keep track of health initiatives, identify ambassadors and facilitate communication. Train people in the arts of corporate wellness through our digital courses. A healthy movement can only exist with sufficient knowledge at key positions. 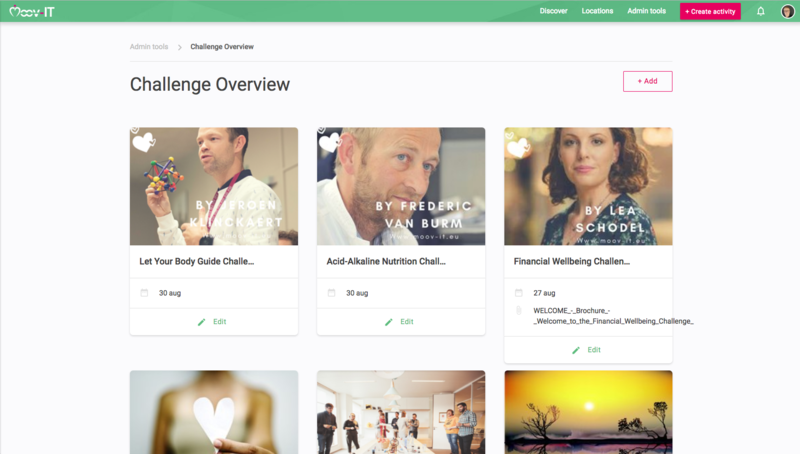 Use the MoovChallenges to easily roll out a health campaign that focuses on one specific unhealthy habit. We provide the material to support awareness, tools to track progress and help lay the foundation for a long-term change in habits. Use a top-down approach to instigate the process and to steer its course. 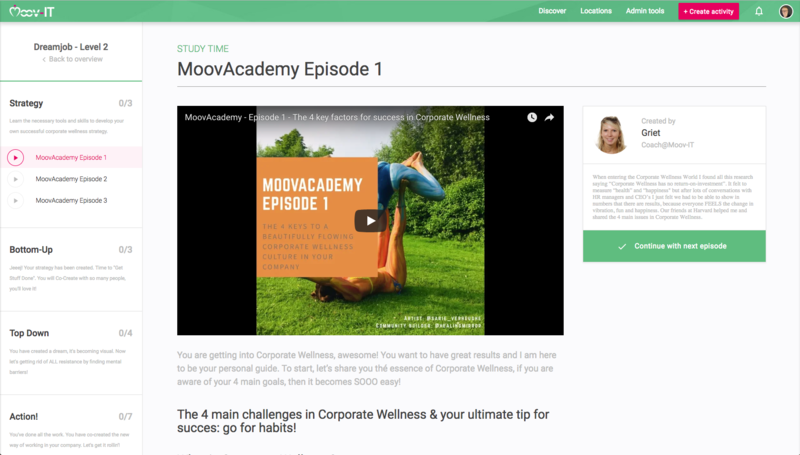 Train management and corporate wellness managers with the MoovAcademy so they are able to keep ambassadors motivated and to set up the MoovCommunity. Roll out company-wide or local health campaigns, called MoovChallenges, with a single click. 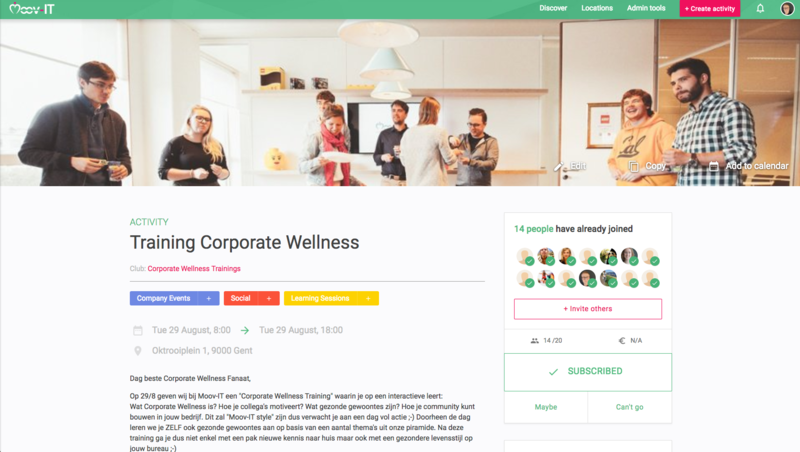 Follow up on all the healthy initiatives in the company, identify health ambassadors and use statistics, dashboards and in-detail reports to facilitate decision making with the MoovCommunity. Our professional MoovConsultants are always ready to help you with any challenge that arises. Use a bottom-up approach to maintain healthy habits in the long term. Ambassadors can easily create healthy events that are automatically promoted. Users can post Moovs, or healthy pictures and stories for everyone to see, to inspire others in their healthy habits. Like-minded people can start a group or club (e.g. the running club) where they can share stories, pictures and upcoming events. To inspire users a list of healthy venues is provided, as well as a library with activity templates. Interested in the ROI your company can achieve? Contact us and a MoovConsultant will make the calculations for you.